There is a growing awareness that non-performing loans (NPLs) generate risks of financial instability and constrain lending growth. A coordinated action to solve the problem of NPLs in Europe is necessary and doable. The European Council is working at a comprehensive action plan including several policy levers (Council of the European Commission 2017). Some of the tools already in place or under discussion are market based, others require policy action and state support. They are all complementary and useful, and efforts to make them more effective and easily accessible should be made in all directions. The burden of NPLs cannot be solved without setting up a coordinated effort of state-backed asset management companies (AMCs). State intervention is required, beyond supporting policies to market instruments, because of the complex interaction between severe capital shortages in few institutions and market failures affecting the secondary market of distressed assets. NPLs are widespread in European countries, with the largest concentration in Italy and the highest NPL ratios in Greece (Enria et al. 2017). Even though averages reflect massive differences across countries with ratios ranging from 46% in Greece to 1% in Sweden, what matters is not just the total amount of these assets, but also their distribution among more or less capitalised banks, larger and smaller banks. 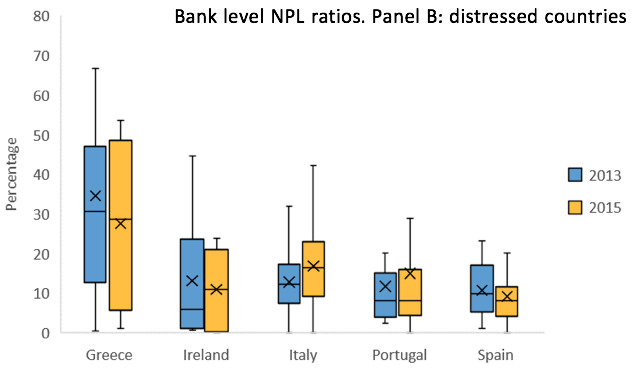 Even for countries with a low average NPL ratio, there is a very broad dispersion among individual institutions (as shown in Figure 1), and Eurozone countries with low aggregate NPL ratios are also affected by this problem. Because of the integration of the European banking system, risks of spillovers and systemic events can be high across the whole region. This is, therefore, a European-wide issue and coordinated European action is necessary. Source: Authors’ own elaboration on Bankscope (May 2017) data. Notes: NPL ratios are calculated as the amount of non-performing loans over total loans. The whiskers represent the maximum and the minimum of the distribution. The box is divided into two parts by the median. The upper (lower) box represents the second and the third quartile of the distribution. The mean of the distribution is represented by ×. The most convincing solution to the NPL problem is implementing state-supported asset management companies in Europe; and it is a feasible solution. The new issue of European Economy reports and comments on the five main proposals, two academic (Avgouleas and Goodhart 2017, Bruno et al. 2017) and three institutional (IMF: Aiyat et al. 2017, EBA: Enria et al. 2017, ECB: Fell et al. 2017), on the table.1 The proposals are not all alike, but they have many points in common, and when there is divergence, the gap to be bridged is pretty narrow. By combining these proposals, it is therefore possible to identify a meta proposal, encompassing common ingredients and viable compromises. Earlier experiences of AMCs set up during the crisis – NAMA in Ireland, SAREB in Spain, DUTB in Germany, and MARK in Hungary – provide also useful insights into how to design these vehicles. For all four proposals, the mechanics work through the transfer of the impaired assets from the bank to the external vehicle at a higher price than the market price. The vehicle, which will be state supported by some means, will then sell the assets to the market after a period of gestation, possibly bridging the gap between the initial transfer price and the market price. All proposals share common underlying rationales and consequently several ingredients. The first element is market failure. All contributors agree that because of asymmetric information, uneven bargaining power between buyers and sellers, and the rapid disposal of legacy assets frequently required by regulators, there is a large gap between bid and ask prices for NPLs and also between the resulting market price and the real value of the assets. For this reason, all proposals have the specific aim of buying time (they all envisage long gestation periods of at least three years), reducing asymmetric information through impartial and accurate asset evaluations, and bridging the gap in market power between buyers and sellers. All proposals also agree that public funding is required to reduce market failures, while complying with state aid rules. So, all vehicles are mixed private/public endeavours. The second element is scale. Managing large amounts of NPLs requires enough scale to undertake a careful evaluation of the recoverability of these loans and enough market power to achieve effective and fair market transactions. Also, secondary markets are affected by first mover disadvantage, in that at the start they are not thick enough to attract sufficiently large number of investors at fair bid prices. For this reason, most proposals envisage the setting up of one national vehicle per member country. Enria et al. (2017), Avgouleas and Goodhart (2017) and Bruno et al. (2017) also discuss European-wide schemes. The third element is European coordination. 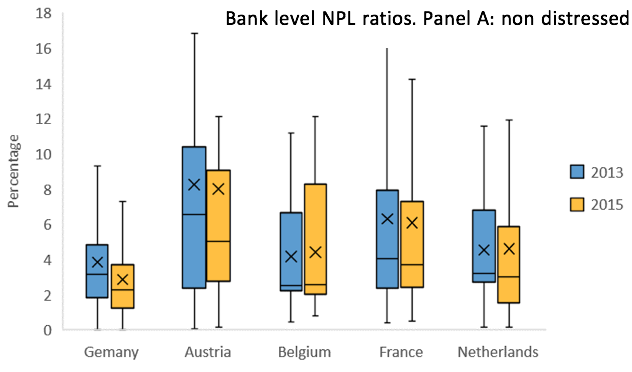 Even though there is large heterogeneity in the NPL ratios across EU countries, they all have banks with large amounts of NPLs in their balance sheets. Therefore, within the EU (or at least within the Banking Union), the conditions for the management and disposal of legacy assets should be harmonised as much as possible, as argued, for example by Ayadi et al. (2017). Consequently, all proposals have an EU-wide or Eurozone-wide ingredient in their architecture. This ingredient may take a loose or a strong form. In the loose form, the proposals envisage highly coordinated national vehicles; in the strong form, a unique EU or Eurozone vehicle. The crucial discriminatory ingredient is the mutualisation of risks among Eurozone countries; in other words, whether the potential costs of the vehicles should be shared by all member countries, or be borne only by the state and the investors of the country where the initial holder of legacy assets was based. Given the political resistance to risk sharing within the Eurozone, all the present proposals shy away from a strong form of coordination, thus only envisaging a form of coordination in mechanisms and rules, or limited mutualisation. The fourth element is moral hazard. There is a need to keep skin in the game for banks disposing of their impaired assets, lest they try to sell to the vehicle their worse assets (i.e. those less likely to recover). Skin in the game might give selling banks also an upside option, in case assets are finally sold by the vehicles at a higher price than initially envisaged. All schemes discussed propose mechanisms of risk sharing between the vehicle and the selling bank, apart from Bruno et al. (2017). There are many options to achieve this objective, from claw back clauses to the banks directly participating in the equity of the vehicle. Whatever the tool, it is clear that some skin in the game cannot be avoided. The fifth element is preserving financial stability. A rapid disposal of legacy assets at market prices by banks with limited capital buffers generates an immediate need for recapitalisation, which might be difficult to achieve at market terms. The higher transfer prices offered by the vehicles proposed here would implicitly reduce the recapitalisation requirements, and hence the risks of resolution or costly early intervention for ongoing institutions. These vehicles are also likely to reduce the costs for taxpayers compared to direct recapitalisation. For this reason, these vehicles are of foremost importance for banks with shortages of capital. Finally, all vehicles are conceived so as to avoid the diabolic loop between banking and sovereign risk. For this reason, the share of public funding envisaged is limited, so as to avoid consolidation of the vehicles in states’ balance sheets. These common elements identify a general framework for action, and essentially the broad ingredients that any scheme should bear. As the need for these ingredients is well accepted, they could provide the main and uncontroversial pillars of a viable blueprint that could be immediately implemented. Of course, there are still several elephants in the room, but consensus on how to deal with them could be built up more gradually. The first, and biggest, elephant, relates the European-wide mutualisation of risks. If policymakers were to be serious about severing the banking–sovereign loop, risk on NPLs should be partly mutualised, especially within the Banking Union. A blueprint envisaging strong coordination among member countries would already be a step forward, but not yet a definitive one, as argued by Avgouleas and Goodhart (2017) and Bruno et al. (2017). The second elephant is whether these vehicles should also be open to banks with no shortages of capital in stress scenarios under stress tests and asset quality reviews, given that a very large share of NPLs is held by these banks. The proposals by Enria et al. (2017) and Fell et al. (2017) are nested within the Bank Recovery and Resolution Directive (BRRD) and the Banking Communication of 2013, which implies that state aid for impaired asset measures can be used only and strictly within the state aid envelope identified in stress tests. Avgouleas and Goodhart (2017) and Bruno et al. (2017) argue, instead, that these vehicles should also be available to viable banks, with no capital shortfalls, and we share their view. Market failures provide sufficient arguments for extending the access to state-backed AMCs to healthy banks as well, particularly until strictly market-based instruments such as trading platforms achieve sufficient scale and transparency. As this would also impact the capital of the beneficiary bank, a careful design of these AMCs should, even in this case, limit moral hazard through burden sharing with shareholders and potentially subordinated creditors. The third elephant in the room is the fixing of the price at which banks would transfer their impaired assets to the vehicles. State aid rules impose that the transfer price should be below the real long-term value of the assets, which is not very easy to identify per se (Galand et al. 2017). This issue creates much uncertainty and leaves large discretion to the DG Competition of the European Commission, which is in charge of identifying this real value. Probably, simple mechanisms, based on experiences in other domains (such as identifying transfer prices for fiscal purposes), could be applied here. Avgouleas and Goodhart (2017) and Bruno et al. (2017) propose simpler pricing rules. The question is still open to discussion, but room for improvement is pretty large here. Summing up, a solution is at hand and a viable, well designed blueprint should be agreed upon by European policymakers as soon as possible. There are still controversial issues on the table, but the ingredients on which there is already consensus in all the main proposals put forward are sufficient to set up an initial effective blueprint. The recent events concerning the liquidation, resolution, or precautionary intervention of Italian (Banca Popolare di Vicenza; Veneto Banca; Monte dei Paschi di Siena) and Spanish (Banco Popular) banks call for an even speedier solution to this problem. Editors’ note: This column is derived from the editorial of the latest issue of European Economy, published on 6 July 2016. The issue was launched at a roundtable at Bruegel, Brussels (see http://bruegel.org/events/non-performing-loans-in-europe/). Aiyar,S., Bergthaler, W., Garrido, J.M., Ilyina, A., Jobst, A., Kang, K., Kovtun, D., Liu, Y., Monaghan, D., and Moretti, M. (2017), "A strategy for resolving Europe’s problem loan", European Economy – Banks, Regulation, and the Real Sector, 1.2017. Avgouleas, E., and Goodhart, C. (2017), "Utilizing AMCs to tackle the Eurozone’s legacy non-performing loans", European Economy – Banks, Regulation, and the Real Sector, 1.2017. Bruno, B., Lusignani, G., and Onado, M. (2017). Why we need to breach the taboos on European banks’ non-performing loans. European Economy – Banks, Regulation, and the Real Sector 1.2017. Council of the European Commission (2017). Report of the FSC Subgroup on non-performing loans. General Secretariat of the Council. Enria, A., Haben, P., and Quagliariello, M. (2017), "Completing the repair of the EU banking sector- A critical review of an EU Asset Management Company", European Economy – Banks, Regulation, and the Real Sector 1.2017. Fell, J., Grodzicki, M., Martin, R., and O’Brien, E. (2017), "A Role for systemic Asset Management Companies in solving Europe’s non-performing loan problems", European Economy – Banks, Regulation, and the Real Sector, 1.2017. Galand, C., Dutillieux, W., and Vallyon, E. (2017), "Non-performing loans and State aid rules", European Economy – Banks, Regulation, and the Real Sector, this issue. Contributors from the quoted institutions are writing in their personal capacity.